You wake up but you’re not awake. The alarm is buzzing in your ear but you can’t figure out how to make it stop. Your hand keeps hitting something next to your bed, but it is obviously not your alarm. What is that? Finally, you find the right button and the blaring stops. The room is now silent. You fall back asleep. Thirty minutes later you shoot up in bed. Why didn’t your alarm go off? You’re going to be late! Wiping the sleepies from your eyes, you stumble out of bed and hit your knee on the table next to it. You’ve always hated that table. Somehow you find the bathroom. You turn on the water for the shower while you brush your teeth. When you take your first step into the bathtub expecting the nice warm comfort of a shower, all you feel is icy cold wetness. You turned the knob the wrong way. Forget the shower. You make your way to your closet and put on some clothes. Do they match? Who cares? Your hair is wet from your ice bath, and you haven’t bothered to brush it. Two pieces of toast and a kiss on the head for Fido before you forget to lock the front door on your way out. You’re late, again, but you’re off for the day. Can you see out of your bloated eyelids? Eh, enough. You just need to make it to your office cubicle and then you can sit down and relax. Coffee! Your mind jumps with excitement! You still haven’t had coffee! You brain starts beating the sides of your skull as a constant dull reminder that it hasn’t been properly caffeinated yet. You quicken your step as soon as you emerge from the Metro underground. You know where to go; it’s automatic. You’re walking, you’re walking faster now. You can see the sign for Starbucks, Pret, Caribou, whatever…it’s right there, two blocks away. You get stuck at a light. Cars are coming. You can’t rebel against the orange high-five. You have 45 seconds to wait. You look to your left. There’s a sign for something that catches your eye. It is red and black and says Zombie…Coffee! It is closer than you think! But wait, will it be good? This isn’t your normal place. Venturing away from your morning routine could be scary. You’ve never done this before. You take the leap. Five seconds to cross the road perpendicular to where you were going. You’re already halfway across the road; no turning back now. Once inside, you realize that this isn’t like the normal coffee shops you frequent. This is actually the frozen yogurt place that you wander into on warm afternoons when the work slows down like summer time. There are no fancy machines or baristas, just coffee. You are one of two people browsing the selection of regular, light roast, or “night shift.” This will take no time at all. You pick up a cup and push the button for your pick of morning fuel. Add Half-and-Half and two Equals. You pay the lady, and you’re out of there within three minutes. No frills, only what you need. You’re impressed with the non-impressiveness of it all. First sip tastes like heaven; no frills, just heaven. This is all you needed today. 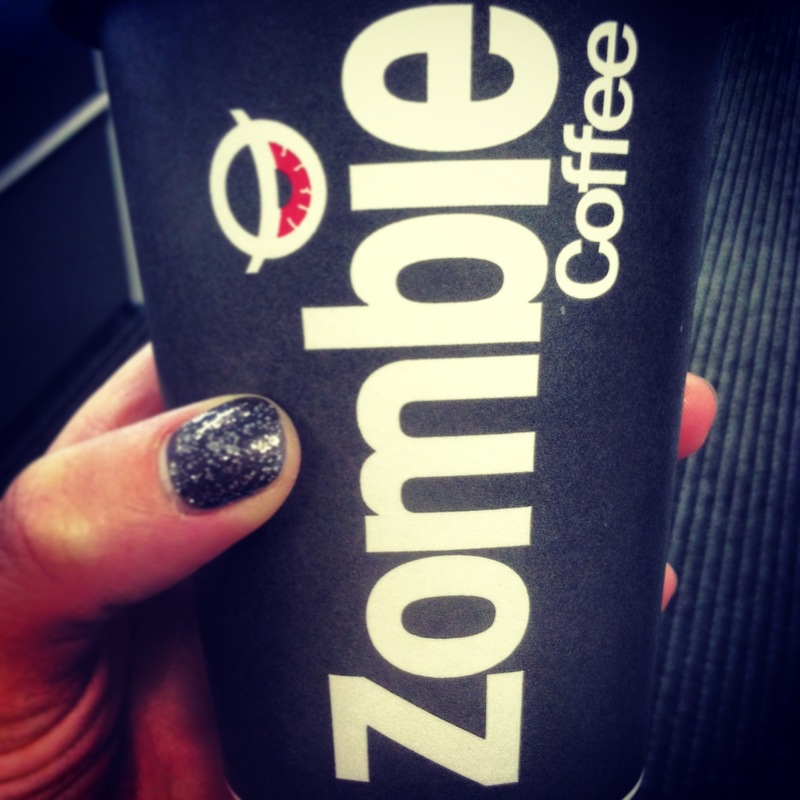 You make it to work just in time, Zombie coffee in hand. Today will be a good day. *** True story: Zombie Coffee is locally roasted in DC.